BoostSpeed scans your computer to pinpoint the issues that may be responsible for the slowdown, and provides a safe and easy way to fix them along with a complete kit of powerful tools to enhance every aspect of your PC's performance. 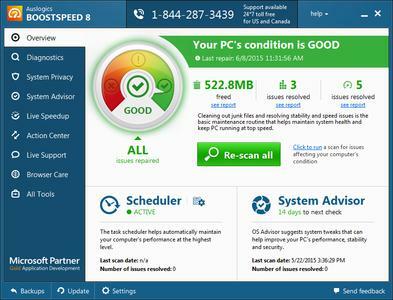 At a click of a button it does all of the following (or only parts you want done): cleans out junk, fixes the registry, tweaks Windows and Internet settings, defragments the hard drive – all to get your PC running fast and smooth again. Your PC is getting slower and you don't know what exactly is causing this. It may be clutter getting out of control, invalid registry entries, fragmented files, incorrect network or system settings, a combination thereof or a number of other things.